If you’re just joining us, you can also see a reveal of my own organized closet here. When we moved into the upstairs bedroom that is now our guest room, my husband got the smaller but more traditionally laid out of the two closets. It looked like the space would be a pretty good fit for him, but he quickly learned that there were some key elements that were off for his lifestyle. He had more shoes than shelves to store them, and the entire concept of neatly folded stacks of, well, anything on a shelf is pretty much beyond him. 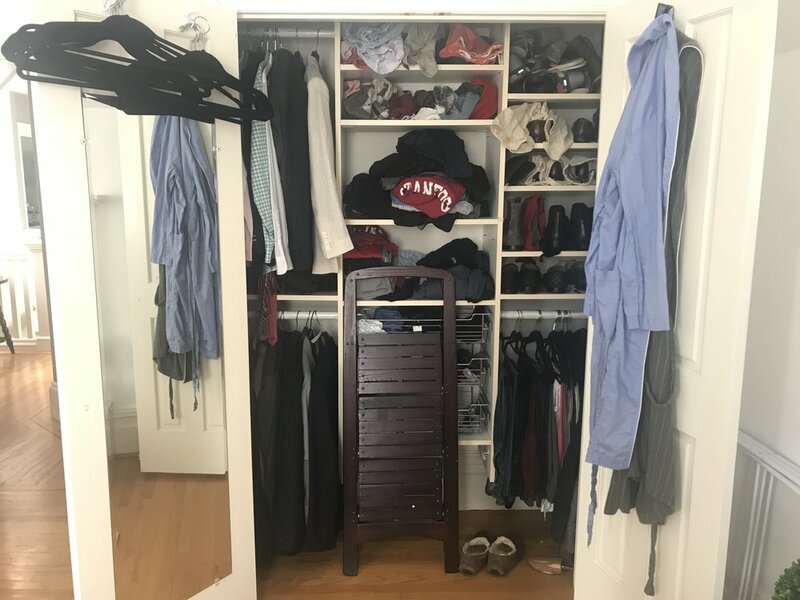 The old closet system may have worked for the previous owner, but for my husband it just' wasn’t the right fit! You see, my husband is a relatively late but extremely enthusiastic convert to the concept of organized living (and also very supportive - he’ll tell anyone who asks that he was my first client!). So, he has the desire for and appreciation of an organized space, but he also has less bandwidth than someone with more experience might have for maintaining an organizational scheme on a day to day basis. In addition to having a lower tolerance for ongoing tidying, my husband is also an out of sight, out of mind kinda guy. When I say that, I mean that for him, things that he can’t see basically don’t exist. Everything has to be visible and accessible, otherwise he forgets about it. Both of these things are just the way he is, and it’s far beyond my ability to change them! So, when we went to design his closet in our new master suite, we laid out the space to work with the way he thinks. Our closets are exactly the same size and dimension, but there are a couple of key differences in them that actually result more from the different ways we operate than the different types of items we own. The most obvious difference is that instead of opaque drawers, my husband’s closet has wire basket drawers. This means that he can see all of his t-shirts, workout clothes, and underwear at a glance. It also means that he doesn’t have to maintain any sort of folding scheme (as you can kind of see here, he does more of a roll method). Another key difference is that he doesn’t have any glass doors built into his closet. It may seem like a small thing, but for some people the few extra seconds it takes to open a door to put something away may prevent them from putting that thing away altogether. For my husband, less friction is best! If I were designing an idealized man’s closet, it might not look exactly like this. But you know what? That’s totally irrelevant. A closet should be designed for the belongings, preferences, and patterns of the person who uses it. The space should enable that person to fully use and appreciate their wardrobe, and maintain the organizing system indefinitely. So no, my husband’s closet is not the most aesthetically pleasing solution that could be created. But that’s not the point! The point is that it works for him, and because it works for him, it works for me.